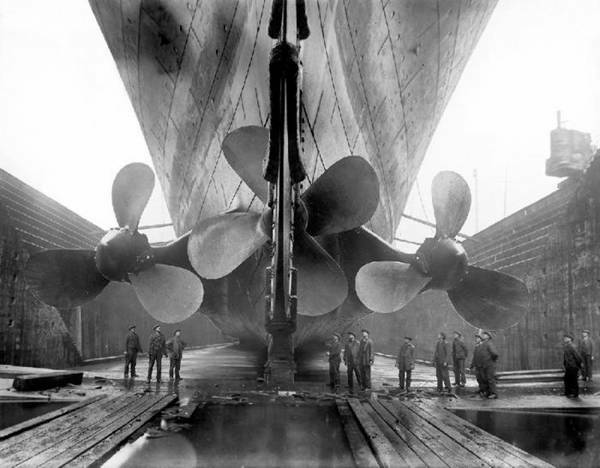 Titanic is the biggest passenger ship in 1912 with a gross tonnage of 46,330. It is also the highest grossing film of all time with $1.84 billion, until it was beaten by Avatar in 2009. This is probably why it is one of the most famous big ships in history. SS Royal William. This was launched in 1831 with a tonnage of 1,370. SS Great Western. This ship was launched in 1837 with a tonnage of 1,700. SS President. This ship was launched in 1840 with a gross tonnage of 2,350. SS Great Britain. This was launched in 1843 with a tonnage of 3,675. SS Himalaya. This was launched in 1853 with a tonnage of 3,550. SS Great Eastern. This was launched in 1858 with a tonnage of 18,900. SS Adriatic. This was launched in 1871 with a tonnage of 3,900. SS Britannic. This was launched in 1874 with a tonnage of 5,004. SS Servia. This was launched in 1881 with a tonnage of 7,400. SS City of Rome. This was launched in 1881 with a tonnage of 8,453. RMS Campania. This was launched in 1893 with a tonnage of 12,950. RMS Lucania. This was launched in 1893 with a tonnage of 12,950. SS Kaiser Wilhelm der Gross. This was launched in 1897 with a tonnage of 14,350. RMS Oceanic. This was launched in 1899 with a tonnage of 17,300.